Matchbook Wine Company is a winery that I consider a friend of the blog. 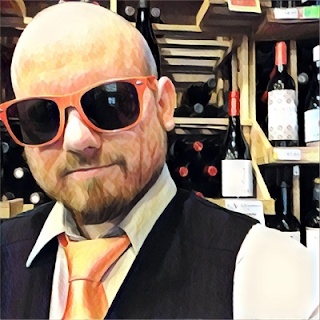 I've reviewed many of their wines and even dedicated a whole month to them in November of 2015. If you'd like to read more about them then check out my article A Brief History of Matchbook Wine Company. Tinto Rey is their new brand that focuses on Spanish varietals and Spanish style wines. If you know about Matchbook or read that article than you know that they're based out of Dunnigan Hills, California, and obsessed with Spanish wine anyways so this is nothing strange from them. This is a review of their 2015 Verdejo and I'm also reviewing their 2014 Super Tinto Red Blend separately. I freakin' love the label. Dueling Spaniards stabbing each other after hanging a dude is the best time ever. While I'm reviewing this wine I'm using The Wine Hook to hold my glass. We'll see how that goes. It's a clip that you attach to your chair so you can use an actual wine glass at, for example, the beach. It goes on beach chairs and patio chairs and all sorts of different kinds of chairs but apparently not on my desk chair. So I've got it clipped to my desk. This 100% Verdejo comes from an itsy-bitsy half-acre vineyard at the entrance of Matchbook's winery that was planted in 2012. It was hand harvested, all of it was barrel fermented, and it saw eight months of aging on the lees in neutral French oak. Only 350 cases were produced and the final ABV is 13.9%. The wine is vegetable oil in color. The nose has a massive layer of flint over the aromas of peach and pear. It's full bodied in the mouth and creamy in mouthfeel with mellow acidity. There's flavors of peach, pear, pineapple (this review brought to you by the letter P) and wood. It finishes pineapply, spicy and viscous. Before I give my final opinion on the Verdejo I've got to say the Wine Hook is incredibly sturdy, well made and useful. 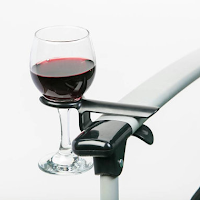 I rarely find myself in a situation to use something like this just because most of my wine consumption is indoors late at night and I'm not bringing a bottle to my kid's ballet class. But I would utilize this all the time if I was an outdoorsy person. My one area of concern is that by the way it rests you subconsciously grab the glass by the bowl and not the stem, and then you lift up and hit the base of the glass on the hook. So I can see some glasses being broken by intoxicated people, but if you remember to grab it by the stem you'll enjoy the crap out of it. You can buy The Wine Hook at TheWineHook.com. 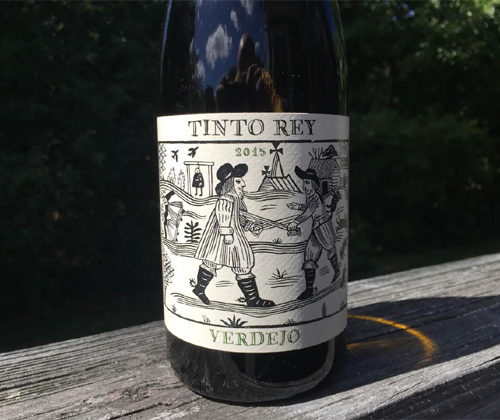 So: Tinto Rey 2015 Verdejo is an excellent alternative to Chardonnay or even Muscadet. I'd actually suggest it to Chardonnay drinkers looking for a pairing with shellfish before I'd suggest a Muscadet to them. And once again, Matchbook has pulled off making a wine that is clearly a California product proud of where it comes from but still paying a great homage to its Spanish inspiration. Well done, once again.